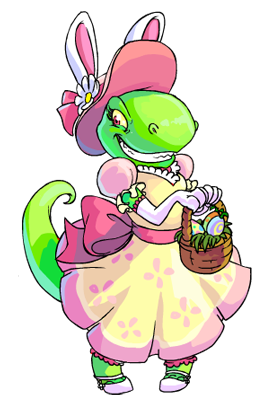 In the spring of 2009, Rosie, a rather charismatic grarrl that loves Easter and dancing, hosted the Neggtacular Springtime Celebration. She will grant you a special spring item each day, and even a bonus for completing a task. Visit Rosie each day at the Neggtacular Springtime Celebration until April 12th. She has a special gift waiting for you, but some of them she has misplaced. Find all her missing gifts and receive a special bonus prize. Bonus This item was given to those who collected all the previous prizes. April 9 This tropical island's mystery? A reward that's sure to bring you glee! Randomly awarded while visiting links on Mystery Island. Today, you received your free gift, plus the prize from 4/4 (a Neocash item)! Enjoy your prizes and thanks for your patience! April 7 Somewhere on this frozen peak waits a prize for those who click and seek. April 5 A deck on this interstellar base is your prize's current resting place. Visit the Virtupets Space Station Recreation Deck or Supply Deck and visit the links. April 2 In a frightful woodland's carnival ground. Find treasure just by clicking 'round. Visit the Deserted Fairgrounds shops and games.